I have made these umpteen times and they have always turned out bouncy. However cooking is not always smooth sailing and I have to confess that I did 'muddle' up the steps once and the ngau yoke yuen did not have even a hint of a 'spring'. It is not so much the ingredients that makes the beef balls springy but the process of making it. If you do try it please follow the instructions very carefully. I have videoed the whole process to make it easier to follow as well as to remind myself of the steps so that I won't muck up ever again. As the meat is minced to mush, the cut of beef is not important. I have used chuck, bolar, blade and even rump steak. 1. Mince the beef in a food processor until a paste is form. Add 5 Tbsp water (a Tbsp of water at a time) to get a smooth paste. 2. In a separate cup, mix together the remaining water, fish sauce, salt, sugar, oil, cornflour, baking powder and alkaline water. 3. Remove the beef paste from the food processor and put in a big bowl. Pour the liquid mix to the beef paste and stir well slowly until the liquid is absorbed into the paste (use either your hand or a fork). 7. Add pepper to the paste and stir to combine. Scoop the paste onto your wet hand. Push the paste through your thumb and 2nd finger by making a fist. Use a wet spoon to scoop and drop it into the hot water. To prevent the paste from sticking to your hand and spoon, wet the spoon and hand with water). 8. Continue until the beef balls form a layer in the water. Now turn on the heat but do not let it boil just simmer slowly without bubble....if not your beef ball will not have 'bounce'. While cooking the beef balls, any leftover paste should be kept in the freezer. 9. Fill a big basin with icy cold water. When the beef balls starts to float, leave for a few more seconds. (Cut one in half to see if it is cook. The inside should not be pink). Scoop out and let it cool in the cold water. 10. After the beef balls have cooled, use as required or freeze. This is a 1 minute video of the whole process of making the beef balls. Wow! Looks yummy!!! Will put this recipe into my "To Do List". That reminds me of the 'chu yoke yuen' back in KL. Thank you for the recipe. Will try to it with pork meat. Suomi, I have not tried it with pork. Hopefully it turns out as bouncy. Great video!! Ngau yoke yuen looks very tasty. But can you please tell me, if I can substitute beef with fish so that I can make fishballs? 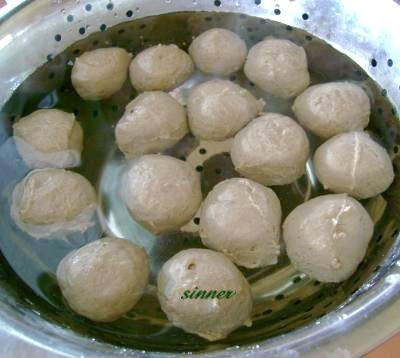 backyana - I believe fish ball uses a different method. If you don't like beef, maybe substitute with chicken or pork though I have never tried with either of those so don't know if they will have the same 'bounce'. Thank you. i made bouncy beef balls yesterday. it was unbelievable (to myself)a success. y dropped one ball on the floor: it just bounced and bounced like a real ball. so perfect! So glad you achieved the much sought after 'bounce'. Do you think we can substitute the beef for fish and make springy fish balls instead? I have never tried it with fish so can't really say whether it would be 'springy'. However if you do try it with fish, would love to hear the result. Made your beef balls today!!! It was a success!!! (Thanks to your detailed instructions)Anyway, I have a recipe for Wan Tan Skin that I would like to share with you... if you like. I learnt it from a Tim Sum Master. It turned out so well and is easy to make. Let me know how to send it to you online. It's ok if you already have a good one. Am so happy of your success with the 'balls' :) Really appreciate the feedback. I have a wantan skin recipe which I have been using, BUT I will never turn down an offer of a tried and tested recipe from a Tim Sum Master. If you could reply to this comment with your email address, I will email you. To keep your email address private, I won't print/post your comment here. Thank you so much for sharing with me your wantan skin recipe. hi sinner, i would like to try this recipe since my husband is a fan of beef balls. i was wondering, what kinda beef (which part) is suitable for this? Thank you so much for sharing this recipe! I made some just now and absolutely love it! So glad you like it. Your photos are so perfect. Per ur instruction no. 8, can you pls enlighten me? If I do not let it boil or cook w/o bubble. At which point do I know it's cook? Many tks in advance! Does the kan sui (lye or alkaline water) play a big role in making the beef balls? It might not be availalbe where I am moving to. Can it be substituted? Also, Do you have a great recipe for won ton skin? Kan sui will make the beef balls extra bouncy. But there have been times I have omitted it. There will still be a bounce. I am afraid there is no substitution for kan sui. At some stage in the future, I will post a recipe for wonton skin. At first when you put the raw beef balls into the hot water, they will sink to the bottom. When you turn on the heat, as they cook, you will notice some will rise to the top. Just like cooking tong yuen (glutinous rice balls). They come to the 'floating' stage quite quickly. To confirm they are cooked, cut one of the floating ones in half (per step 9). The inside should not be pink. If they are, leave it in the water for another few minutes. Then scoop them into cold water. Step 8 and 9 is to ensure you get bouncy balls. After the balls have cooled down, you can then boil them as much as you like with your soup or noodles to cook them more thoroughly before eating. Thank you! Your instruction is crystal clear. Will find time to make it. Ah! !thanks for this recipe..have been looking for making bouncy beef balls instead of buying..cheers! sofood, would love to hear your feedback after you try out the recipe. Thanks for dropping by. Thank you! I had been making beef balls so many times but they never turned out to be bouncy and I was really disappointed. Then I was watching youtube and suddenly saw your video and ofcourse I tried your recipe right away. Thanks a lot! Glad the recipe turned out bouncy balls for you. Appreciate the feedback. I am sooo happy i found your site. I just made the beef ball and yes, they are bouncy! But i hv a problem, mine dont look smooth on the exterior. Next try is my fave chee cheong fun with Thim jeong. I miss it sooo much. Every trip back to Msia is means CCF heaven for me :) Tks!! Wet hands and wet spoon should make the outside of the balls smoother. Looks aside, am glad your beef balls were bouncy. Would love to hear how your chee cheong fun turn out. Thanks for the feedback. Hi, I'm so glad that I found your recipes on bouncy balls!! I'm curious about the adding of lye to the meat, was it just add flavour to the beef mixture or it has other function? Can I omit adding lye to the beef ball recipe? would it make a different..less bouncy? When I first started making beef balls, I was told lye water is supposed to make the balls bouncy. But I have gradually phased out lye water when I make these now, and it hasn't affected its bounciness. So you can omit if you want to. Found your post on other recipes and now had led me to one of my favorites the beef bouncy balls. I'm from the US so when I am looking at the ingredients it is a slight confusion is cornflour in New Zealand cornstarch for the US? Also is the baking powder single acting or double acting or there isn't much difference? Thanks for the recipes and help. Cornflour and cornstarch - difference could just be how it is called in different country. But just to be sure the cornflour I use is 'white' like flour. Do not confuse it with cornmeal which is yellow. Double acting baking powder reacts twice - once in liquid and then in heat. Single acting - only 1 reaction. Mine wasn't listed as double acting or single, so I phoned the manufacturer listed on the label to confirm. Have not tried your Rice Roll N BEEF BAL recipe yet BUT MUST give A BIG BIG ROUND of APPLAUD in Advance first!!! Will update u when I have made it !!! So glad it turned out bouncy. Isn't it great when it turns out well. Hi, superb site. Quick question, been reading the site but could not seem to find an article on the soup for the noodle. 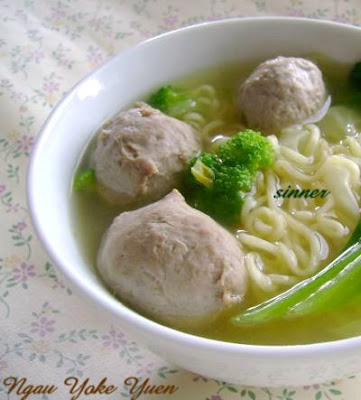 How do you make the soup for Ngau Yoke Yuen ~ Springy n' Bouncy Beef Balls. The soup will depend on how much work you want to put into it. You can get some bones and boil for soup. Or for me I use the shortcut, which is keep the stock that is used for boiling the beef balls, add some stock cube and hey presto - soup ! What is the significance of using baking powder? I tried making the meat balls last week and I failed miserably. Ah well better luck next time. I have to eat the failed ones of course as I hate wasting food. No idea of the significance of baking powder. It is part of the recipe so must have its function. If you have omitted the baking powder and hence failed - then that might be your answer. Finally I got "the bounce" I was looking for. I use the same measure amount of the Fish sauce but it was a little overwhelming. I think I'll a little bit next time or may substitute a little five spice powder instead. I just tried it, followed as closely as i could, except I did not add lye/alkaline water and i used double action baking powder. It was an epic failure... boo hoo hoo... The balls are not bouncy and tastes sandy. I don't know what has gone wrong. Any suggestions so that my next attempt would be a success? Thanks. Not adding lye water is not the reason for your failure. Nowadays I don't use lye water but the 'balls' are still bouncing away. Rather than repeat myself, have a read through the comments on here and in the 'chicken' and 'pork' balls recipe for more tips. totoro - congrats on getting the 'bounce'. I believe the function of baking powder is to tenderize the meat. It should not affect the bounciness of the ball. I follow every step of the recipe but they turn out very mushy, not bouncy at all ! I wonder what happen ? Please advise. Hi Sinner - living in Dubai I have resorted to making a lot of Asian foods from scratch as I can't get them here as easily as when I lived in New York. Thank you for your wonderful web site - Last week, I made Ngau Yoke Yuen successfully (I never thought that I, the average home cook, could ever make something like that!) and can't wait to try out some of other other favorite dishes that you have posted. I have also made Beef Wellington per your instructions for the 1st time and my British husband proclaimed it a delicious success! It is so refreshing to get a positive feedback/comment for a change instead of questions. I am so glad you made this ngau yoke yuen sucessfully. Dare I say, Gordon Ramsay would be so proud of you for your delicious Beef Wellington ! I really appreciate your feedback. Thank you. I've been using this recipe since 2 years ago. Works every time - just like this evening. Really appreciate your positive feedback. Yeeesss....another successful outcome! Thank you. Thank you for sharing this lovely recipe, it worked so well for steamboat during CNY! I've made a few flavors e.g. Toong Choy, dry-cuttle fish, spring onion, coriander and chili mix. Wow my husband (English) and kids and all my Chinese friends love it. We have Chee Cheong Fun next day with all the left over meatballs. What a fantastic recipe! Absolutely delighted! May God Blessings Be Upon You and Family All-The-Time! Yum..I can almost taste the ones with the dry cuttle fish. Love those. Initially I did use lye water, not now. I found it did not make any difference to the bounce. The balls were just as bouncy without lye water added. Your recipe was amazing, I've just made it for the first time and my husband has already snacked away a third of these delicious bouncy beefballs. Nice job! I will be trying many more of your recipes. I have been doing batches and batches of the bouncy beef balls ever since I discovered your recipe! it is way better than any of the beef balls that we get out at the shops and always a hit for steam boat, lunch or even a quick midnight snack. I found using beef shin even works better! bit of tendons helps with the bit. Thanks again for your fantastic blog! keep it coming! 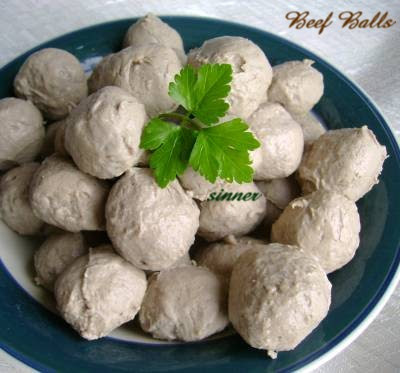 I have been making batches after batches of these beef balls even since I discovered the recipe last year! it is so much better and I feel better to eat them than the ones that I got from the shops. I know exactly what good and decent meat got into the balls and no fucky chemicals that I don't know what they are for. I do however find different cut of meat produce a different variations of the balls. My current fav is 50% chuck and 50% shin. Agree totally - no chemicals in these homemade balls. Pure and healthy ! Appreciate your feedback. I must try some with tendons next time. Thanks. Made it last weekend. It was so good even my picky eater toddler grand-daughter loves it. I added a bit more salt coz after cooking the beef ball taste a bit flat. Thanks for sharing. Thanks Mrs Razak. Glad your picky grand-daughter likes the beef ball. We usually eat ours dipped in chilli sauce. I went to watch some video in Youtube and found your website. Thanks for sharing in details. A word of advise, never wash the fish fillet once you slice out from the fish. Wash the fish well and dry it. After that no more washing. MUST use tapioca flour and not cornflour as cornflour will make the food soft and not bouncy. I think I will add in the reminder water all in just before I turn off the chopper. Can I ? Why have to mix with hand ? Thanks again. Happy cooking !! Are you using all lean for your beef balls or is there a lean/fat ratio that you are using. I prefer to use lean meat. hi, what happen to the water used for boiling the beefballs? can we use it as soup or just throw it away?